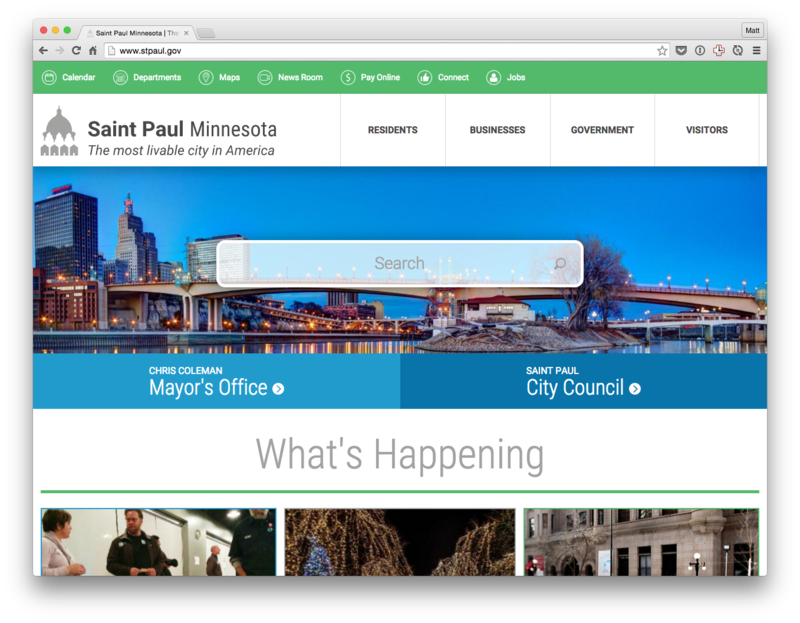 Over the last four months, we partnered with the City of Saint Paul and the Office of Technology and Communications department to develop their new website. We worked with the team on content strategy, overhauling visuals, creating front-end responsive templates and building out a content management system. The first thing the we needed to do was come up with a content strategy for such a large website. We were delighted to collaborate with Lindsay Dinkins and construct a plan to manage and restructure thousands of pages to integrate into the new platform. Once the content was finalized, we partnered with engineers, project managers and team leaders to built out a responsive design with an intuitive user experience. The website was built in Drupal because of its flexibility to add more features and its ease of use. Today, the site was released! The new and improved https://t.co/6dF16j8ofI is live — check it out! We’d like to thank the City of Saint Paul for giving us the opportunity to work on this project.